Courses : from the 03rd to the 10th and the 20th to the 27th every month. be offered from the 11th to the 18th instead. Every year the fascinating charm of Koh Samui persuades many tourists from all around the world to come and find an exiting experience. They return home with unforgettable impressive memories. In addition to those beautiful natural sea beaches, blue sky and beautiful nights, many people may not know that Koh Samui has another choice of relaxation. It is also completely different from the joy and fun that they expect and are familiar with. At Dipabhāvan meditation center one can experience the joy of a peaceful and tranquil mind. Dipabhāvan provides everything necessary to facilitate meditation training such as a beautiful and secluded environment, proper regulation, suitable accommodation, nutritious, vegetarian food and experienced and friendly staff. Dipabhāvan is located on the hillside slope of the high mountain in the southeast of Koh Samui. When you look around from there, you can see beautiful sea views, coconut trees and high mountains covered by green forest. All of those are the conditions supporting the meditator to progress in meditation. The name "Dipabhāvan" means the Development of Light Hermitage. 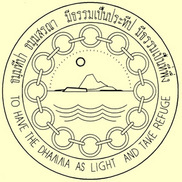 The "Light" is the light of Dhamma. The Dhamma (Pali language) or Dharma (Sanskrit language), the teaching of the Buddha, is the refuge of the troubled mind, is the island in the ocean of human difficulties. The waves in the picture to the left symbolize the ocean or the cycle of birth, death and misery. The Sun is representative of wisdom. The Island represents salvation. The twelve chains stand for the law of phenomenal Cause and Effect which stand for the causes of misery and ways to end misery. Dipabhāvan was established in 2005 for use by both Thai and foreigners. Since then many people from various countries have joined the retreat. They have found something different and more profound than they have ever known. Dipabhāvan welcomes everyone who would like to fulfill their life by benefiting from Dhamma practice. The retreat is open for people from all walks of life, races, sexes, faiths and beliefs without prejudice or discrimination. Ajahn Poh, the abbot of Suan Mokkh, is the founder of Dipabhāvan. He and/or other monks from Suan Mokkh come to run the retreat every month since the beginning. The teachings in Dipabhāvan is close to the teachings at the Suan Mokkh International Dharma Hermitage. There is no fee for participating in the courses. Following the Buddhist tradition all teachings are offered free of charge. At the end of the retreat, however, if the participants are ready to help Dipabhāvan and future students, kind donation to support the costs of the books, food, electricity, water, petrol, maintenance of the facilities, salary for Thai staff etc. would be gratefully accepted. We, "The Development of Light Hermitage", would like to express our heartfelt gratitude to all participants and everyone supporting this place. May Lord Buddha and his Dharma bless everyone with good health, good life, happiness and strength forever.